As we step into the new year, so does Highways England (HE). The company has announced that cars of the future could be programmed to spot potholes on motorways and automatically notify them to schedule repairs. Introduction of Intelligent Network Could Help Reduce Number of Car Breakdowns and see a decline in road rescue call outs. 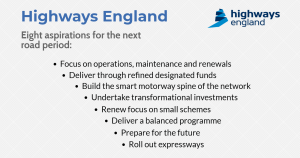 Highways England presented their plans for the future in its Strategic Road Network Initial Report on 13 December 2017. HE said that an intelligent network coupled with connected vehicles would improve road maintenance efficiency, as well as safety. HE has said that they are currently putting stress on increasing the role of technology to keep people moving, and the country connected. This technology development does not stop at automatic pothole reporting, it’s been mentioned that there are plans to begin using drones to fly overhead and report back on incidents, improving response times. “We are delivering a record £15 billion of government investment to give people safe, efficient and reliable journeys, and provide businesses with the links they need to prosper and grow. O’Sullivan encourages people to read their Strategic Road Network Initial Report and feedback through the Departments for Transport’s consultation, which has also now been launched. The results of the consultation will be used by the department to help develop the next Road Investment Strategy which the government is expected to publish in 2019. It is then that detail on specific road projects will be outlined. HE are proud of their work so far, ever since their creation in 2015 they have completed 18 major road improvements and has a further 15 currently in construction. “This government is making people’s journeys better, faster and safer to give people better access to jobs, schools and their community. Road users are sure to welcome any positive changes to the motorways, especially if these will mean improvement in their safety and the health of their car. Check out our article about another recent technological approach to improving safety of road users and pedestrians via Smart Crossings.